My work toggles back and forth between botanical and non-botanical subjects. This year, as the title suggests, my work for the show is botanical in subject matter. I’ve been painting big. Some of these canvases are my biggest ever. Since I usually paint horizontally, on a drafting board, at 30”x40” they are about as big as I can go. But I love detail and big canvases allow me to dive deeply into detail. “Nobody sees a flower really; it is so small. We haven’t time, and to see takes time …So I said to myself … I’ll paint it big and they will be surprised into taking time to look at it”. 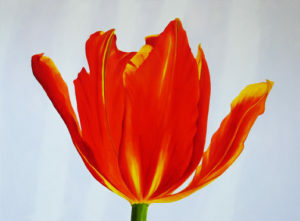 I often paint tulips. I love tulips because they are constantly moving. Even when they are cut, they follow the light, bending and swaying, opening and closing. Each night they close and each day they open a little wider, spreading their arms to the sun. One Saturday I used several tulips in an arrangement of altar flowers. I loved the way their stems curved upward and used that curved line as part of the arrangement. When I came back on Sunday morning they were sticking straight out sideways! They were searching for sunlight.